CRADLE OF FILTH - DUSK... AND HER EMBRACE LTD. VINYL (2LP) | Online Shop | Wizard LTD. 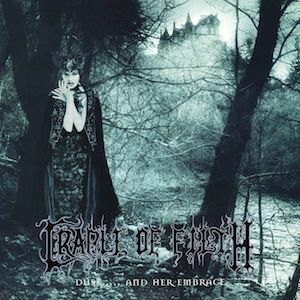 Album: "DUSK... AND HER EMBRACE LTD. VINYL (2LP)"
“Dusk.. And Her Embrace” was Cradle of Filth’s second album, and first for their new label at the time, Music for Nations. The album featured sweeping, epic compositions and improved production values courtesy of Kit Woolven, and became a huge success, with Cradle of Filth’s strong brand of symphonic black metal catapulting the band to worldwide renown due to the album’s universal critical and commercial reception. “Dusk.. And Her Embrace” further explored themes of vampirism and paganism in its lyrics, following on from the foundations of their earlier works, and features a guest appearance by Cronos of black metal legends Venom on the track “Haunted Shores”. This album is presented on gatefold double heavyweight vinyl and is limited to just 2000 numbered copies.